Provided in the Law of Water, the accountability for water resources use was established with three objectives: to encourage the rational use of water, give the user an indication of its real value and obtain financial resources for the financing of the programs and interventions included in the Water Resources Plans. Since 2001, together with managers and state committees of watersheds, ANA develops initiatives to implement the accountability in Brazil. The four watersheds currently benefited by accounting for the use of water are: Paraíba do Sul river watershed, which covers São Paulo, Minas Gerais and Rio de Janeiro; Piracicaba, Capivari and Jundiaí river watersheds (PCJ), which cover São Paulo and Minas Gerais; São Francisco watershed, covering Alagoas, Bahia, Goiás, Minas Gerais, Pernambuco, Sergipe and the Federal District; and Doce River watershed, which covers Minas Gerais and Espírito Santo. The collected funds are passed on in full by ANA the respective entities which delegates the water agency functions to be applied in water-environment improvements, in accordance with the plans of multi-annual implementation approved by the respective committees. The resources have made initiatives possible for the recovery of watershed areas such as, for example, the drafting and implementation of studies, plans and projects of basic sanitation, erosion control, restoration of degraded areas and environmental education. One of the most important objectives of ANA is stimulating and providing support initiatives aimed at the creation of state bodies managers of water resources, watershed committees and water agencies. With this in mind, the present study aims to strengthen the implementation of the National Policy of Water Resources in a shared way, decentralized and participatory, in answer to the precepts of the Law of Waters. The watershed committees constitute the basis of the National System of Water Resources Management (SINGREH), being a concrete example of democratic management. Public Authority representatives, civil society organizations and water users make up these associations. The creation of a committee is subject to approval by resolution of the National Council of Water Resources (CNRH), being subsequently released by Presidential Decree. 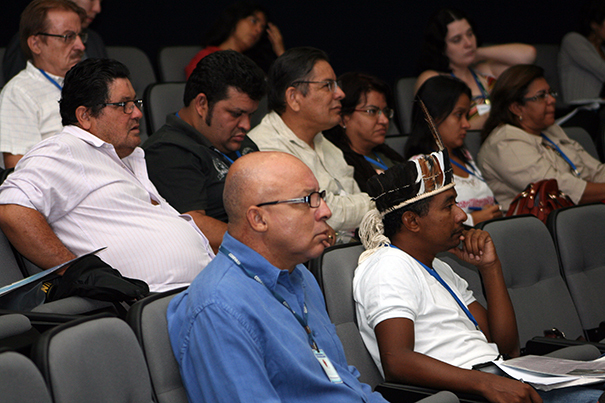 ANA also develops initiatives in favor of training and awareness of Brazilian society in relation to water resources. The target audience is very varied: manager agents of bodies of water resources, members and watershed bodies leaders, users of water resources, opinion makers and young people. It also participates in the training of managing agents in several countries that ANA has international cooperation with. Good example of initiative concerning communication initiatives, dissemination, social mobilization, training and education for the management of water resources in Brazil and other Latin American countries and the Water - Knowledge for Management project, developed in partnership with Itaipu Bi-National and with Itaipu Technological Park Foundation. The initiative offers more than 25 courses, all free of charge, on various issues related to water management, in Portuguese and in Spanish, in addition to initiatives involving radio communication and social networks on the Internet. In order to promote integrated management of surface and groundwater, ANA has a wide agenda of initiatives on these issues. National Water Agency, according to the National Program of Groundwater (PNAS-PNRH), whose central focus is to strengthen the integrated management of underground and superficial water in the country, aimed, in particular, to provide the organs of State water resources managers of geological knowledge, managerial and technical and specific training in groundwater. So, they can play properly systemic management and integrated water resources management.